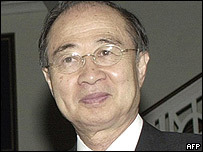 The special Japanese Peace Envoy to Sri Lanka, Yasushi Akashi, has said that aid funds pledged last year are tied to progress in the peace process. Mr Akashi said he hoped peace talks in the island - which have been stalled for the past year - would restart within the next few months. He has spent four days talking to all sides of the political divide. At the end of his visit he commended the new government for showing a firm commitment to the peace process. The BBC's Anna Horsbrugh-Porter in Colombo says that Mr Akashi also warned that any resumption of talks could still be sometime off, probably later in the summer. He said both sides wanted to make sure fresh negotiations would be well-structured so that they could make real progress. The peace envoy said that the delivery of the $4.5bn of aid pledged to Sri Lanka at last June's donor conference in Tokyo was linked to definite progress in the peace process. 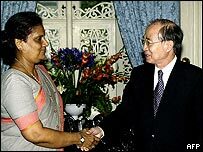 The Tamil Tigers have always insisted that any resumption of talks must be based on their proposals for an Interim Self Governing Authority (ISGA) which would give them substantial powers. These include the right to impose the rule of law, collect taxes, run the administration and oversee the rehabilitation process in the north and east of the island - areas which are traditional Tiger strongholds. Speaking in the capital Colombo on Wednesday, the head of the Tiger's Peace negotiating wing, S Puleedevan, reiterated the need for the ISGA to be on the agenda before new talks begin. He emphasised his commitment to the peace process and the ceasefire agreement signed in February 2002 despite the recent change in government. There has been no response from the government so far, but in the past the President Chandrika Kumaratunga has made clear her concerns about the Tiger's ISGA proposal. Mr Puleedevan's briefing to the press was the first time that the guerrilla group - once outlawed by the government - has been allowed to speak openly to the media in Colombo. He said he was confident that Norway would help the two sides iron out final details for renewing talks. "Discussions are going on as to when and where the peace talks will resume, and what will be the agenda. "The Norwegian envoy Erik Solheim will be coming again soon, and after that a date will be announced," he said.